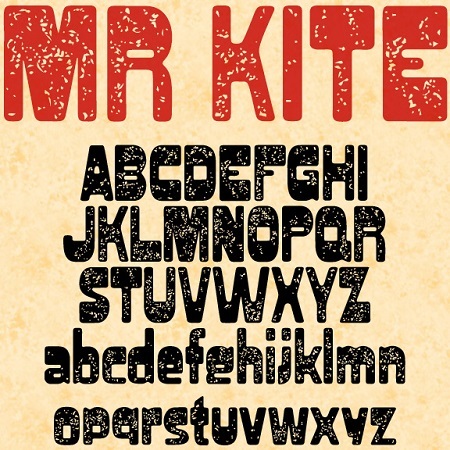 Mr Kite began with a 19th-century woodtype font variously known as Jubilee and Gothic Bold. The heavy weight at the top gives it an offbeat character. My original version of that is called Blacktop, rounded out with lowercase. For this variation, I added a distressed texture that suggests a weathered sign or a well-worn T-shirt. Some may say this font has a groovy vibe, given the letterforms. I think this reaction is related to the familiar appropriation of Victoriana and Art Nouveau in the 1960s and 70s. Elements of those styles became so entwined with “mod” pop culture that it’s easy to overlook the original source. The name of the font is a nod to “Being for the benefit of Mr Kite,” a Beatles song that was itself inspired by a 19th-century circus poster.